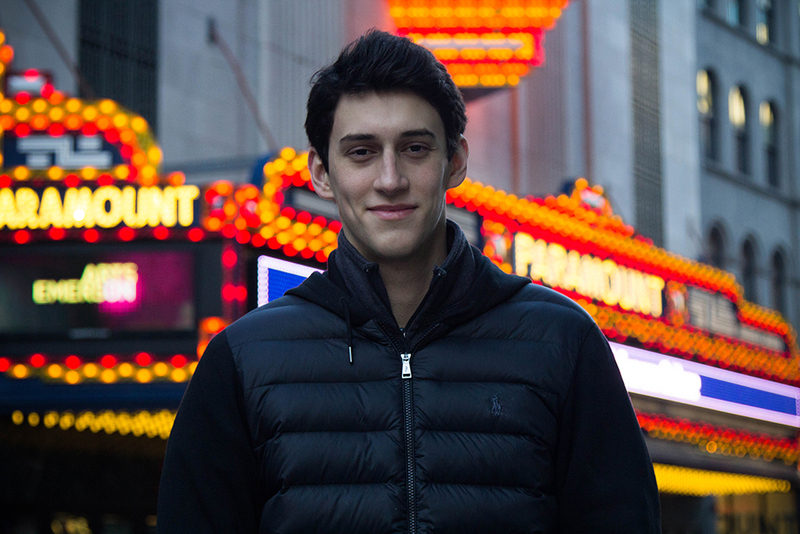 Freshman Pedro Noah Espinola's first feature film ran in theaters in Paraguay for three weeks. Amigos, Emerson’s Latinx cultural organization, presented the movie in the Bright Family Screening Room. Amigos President Juan Coral said the event was organized after Espinola told the group about the film and showed them the trailer during a meeting. Saber Crecer is Espinola’s first feature film. Prior to the screening, the visual and media arts major told the audience the budget was $10,000 and that private sponsors funded the production. After the showing, co-director, co-writer, and actor Espinola answered questions from the audience. The coming-of-age story follows high school senior Danny as he struggles to confess his love for his best friend Claire before he leaves Paraguay to attend college in America. Espinola plays Cameron, an American party lover and Danny and Claire’s friend. “I’m kind of like him but less douchey,” Espinola said during the Q&A. Espinola said he started writing the screenplay January 2017. The final film was finished in early August. Espinola told the audience the title translates to “Knowing to Grow,” which reflected the filmmaking process. He said he made two short films before Saber Crecer, but he and the crew still had to learn on the job. Espinola said the oldest person involved in the production was 21 and the youngest was 16. Espinola said building up the Saber Crecer Instagram profile and releasing a trailer on YouTube were crucial to gaining sponsors and a distributer. Their Instagram has 1,870 followers and the trailer has over 24,000 views. The film features both English and Spanish dialogue. Espinola said the movie is bilingual because he wanted the film to stand out as much as possible. Espinola said Paraguay’s film industry is tiny, and he wants to help it to grow. He said he attended the premiere and one regular showing. Espinola said the biggest challenge was post-production, particularly creating a digital cinema package, the typical format for movie projection in cinemas. He said at one point the crew lost the majority of their edited footage when their only hard drive crashed. Espinola said information is readily available on the internet and people should create what they want to even if the task seems daunting. After the event, Amigos President Juan Coral said he loved Saber Crecer and was impressed by the production, especially since it was Espinola’s first film. Shane O’Neill, a junior visual and media arts major who attended the screening, is a member of Amigos and a friend of Espinola. O’Neill said the film is impressive for a 19-year-old’s first feature length film.